A glove full of Goth, a helping of sci-fi, and a vial of Cyberpunk all neatly wrapped inside a Victorian Satchel�the popular new genre of Steampunk is reverberating throughout our culture in art, fashion, style, and music. Now you can hop aboard the airship and embark on a spiritual adventure that brings dramatic ritual and practical magic into your everyday life with Steampunk Magic. 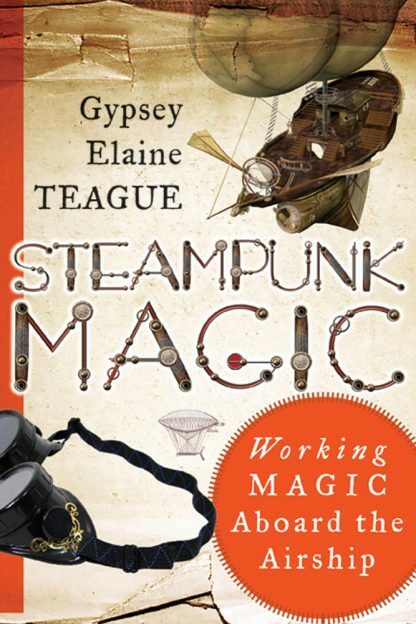 Gypsey Elaine Teague draws on her experience as a practicing High Priestess and magician and her love of Steampunk to bring readers an entirely new magical system. Steampunk Magic is a compendium of altar arrangements, spells, and magical tools�traditional Wicca and magic with a Steampunk twist. Teague shows how to craft and use a compass instead of a pentacle, use a rigging knife in place of an athame, and join an airship in lieu of a coven. Beautifully illustrated with photographs and art. Gypsey Elaine Teague is the Branch Head of the Gunnin Architecture Library at Clemson University as well as a member of the National Board of Certified Counselors, an Elder and High Priestess in the Georgian tradition, a High Priestess in the Icelandic Norse tradition, and a High Priestess and originator of Steampunk Magic. Teague is published in a number of areas and presents nationally on Steampunk history, literature, and popular culture. She is also the author of Steampunk Magic (Weiser Books).